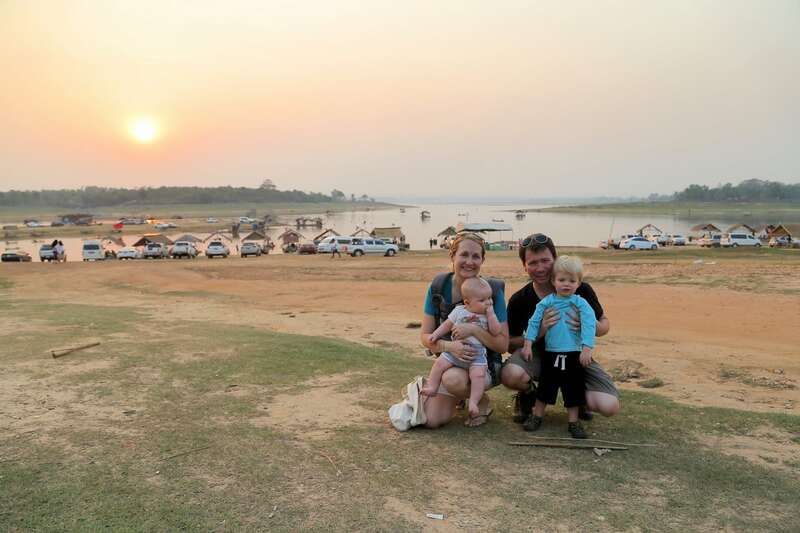 The first year we lived in Laos, we wanted to be around to take part in the festivities on national holidays. The second year, we became increasingly more ambivalent about Lao holidays. Now, well into our third year, we’re more than happy to hide from what sadly amounts to little more than binge drinking and club-volume music into the wee hours on Labor Day, Women’s Day, National Day, and even Children’s Day. Where in other countries people use these opportunities for marches of solidarity and pride, celebration of the contributions of groups of people, or solemn observance, Lao people use any day off to blow out their eardrums and drink themselves into oblivion. 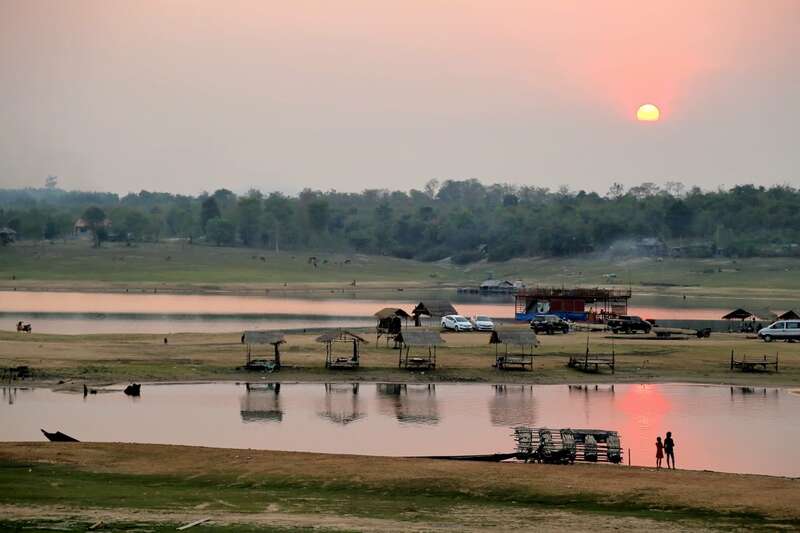 Crime also spikes during holidays and festivals, as thugs from neighboring countries descend on the capital to take advantage of the lack of sobriety and increased number of unwitting tourists who have come to experience the “culture” of Laos. So, yeah, Lori and I aren’t big on Lao holidays. There are a few exceptions. We find that Buddhist festivals and observances are taken quite seriously and have elements of beauty and spirituality that are worth experiencing for us outsiders. Some examples are the beginning and end of Buddhist Lent (Boun Khao Phansa and Boun Ok Phansa) and That Luang Festival. But Women’s Day in Laos, forget about it. There will be no marches, no parades, no big events recognizing the contributions of women in Lao society. Basically, women get together and drink and party all day while the men clean the house and watch the kids. Then, the next day, men and women resume their respective gender roles. Many Laotians and organizations have tried to improve on the status quo, but all have failed. It’s just kind of the way it is. The good news is that this year International Women’s Day falls on a Friday. Which means three-day weekend! We thought about heading up to Vang Vieng or Green View, but really didn’t want to deal with the long drive over the mountains. 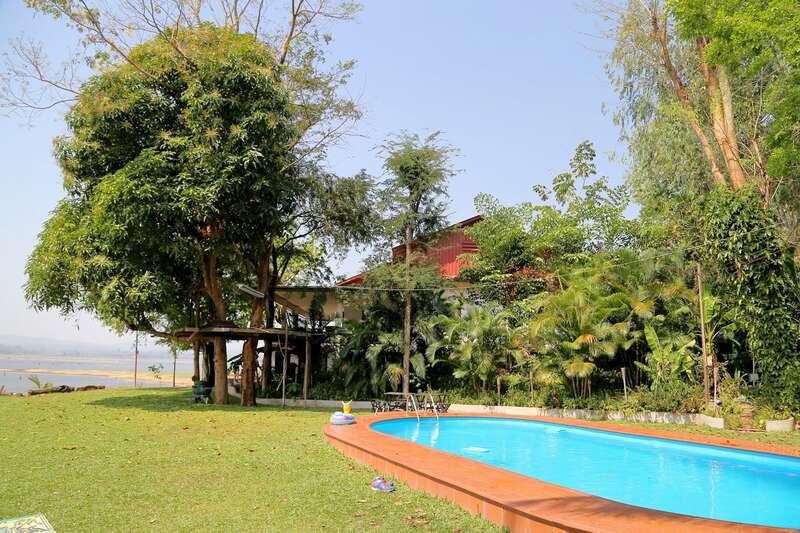 There are few options close to Vientiane for a weekend away. 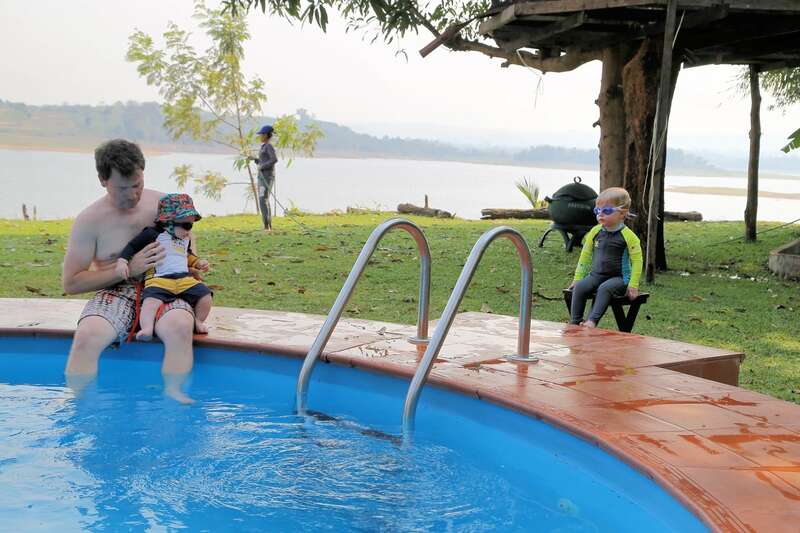 But there is one that all the expats talk about — Lao Lake House. So, Friday morning, we packed up the pickup and headed out of town. We made a stop at our new favorite breakfast place — Bacán Café. New cafes and coffee shops open on a weekly basis here in Vientiane, but most are cookie-cutter Thai or Korean mod/industrial cafes and coffee shops doing the same exact thing, serving the same exact fare, uninspired coffee and the same Southeast fusion menu that feels like a product of a Thai, Vietnamese, and Chinese cook getting together and making a pact that they will not include any of their best recipes. Bacán Café is different. Very different. For one, it’s a Chilean cafe. You read that right — South American! Before Bacan, there were no Chilean cafes in Vientiane. Heck there’s not a single other South American restaurant in Laos, and only two Mexican restaurants in the entire country — Amigo’s in Vang Vieng, and now Gringo’s in Vientiane (Ban Gai, as a Mexican restaurant, is dead). And the food at Bacán is awesome! 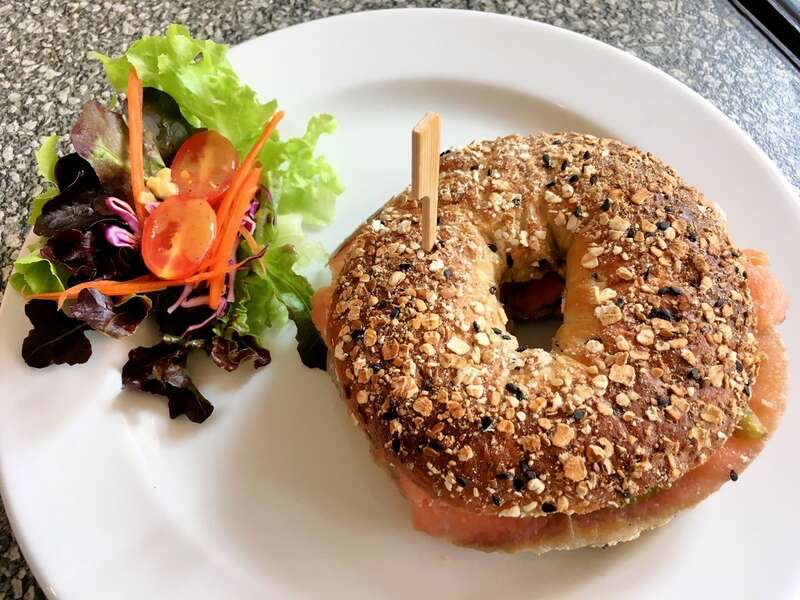 A delicious assortment of empanadas and other Chilean fare, and awesome bagel sandwiches, like this salmon lox on multigrain. 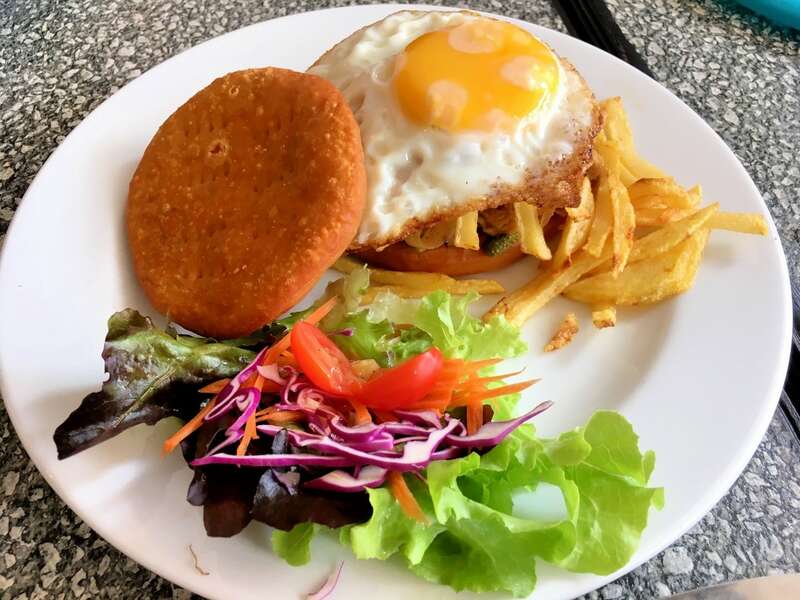 We also tried the machada sandwich, which we’re told is a Chilean national breakfast dish of sorts. And of course, Lori loves speaking with the Chilean owner in Spanish (and Noe gets a kick out of listening to a stranger speak one of his “native” languages). Alright Lori, enough cháchara! Time to get on the road! As a side note, we’ve been fortunate over the past 2.5 years to have regular access to a Toyota Hilux pickup through Lori’s work. It was a perk we weren’t expecting, but one that we have grown increasingly reliant upon, now with two small children and the ungodly cost of having a personal vehicle. 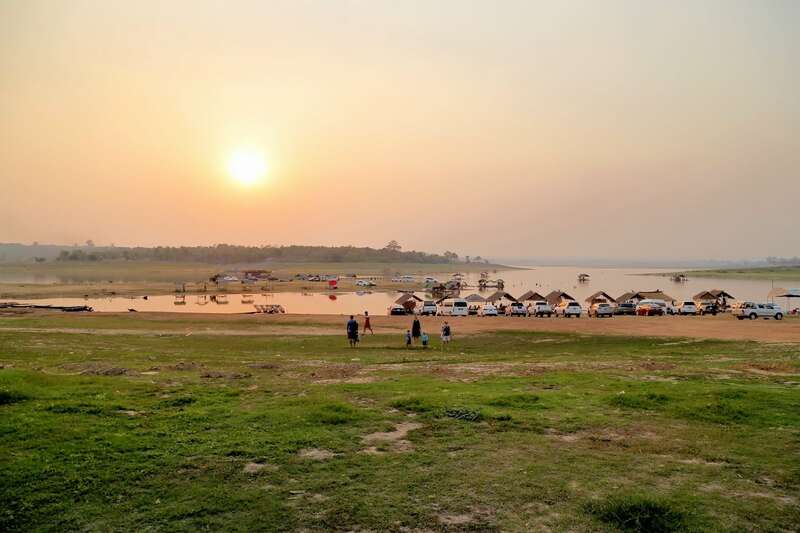 Sadly, the two Hilux pickups will be turned over to project partners at the end of the month with no planned replacement, so our trip to Lao Lake House will serve as a farewell tour of sorts. 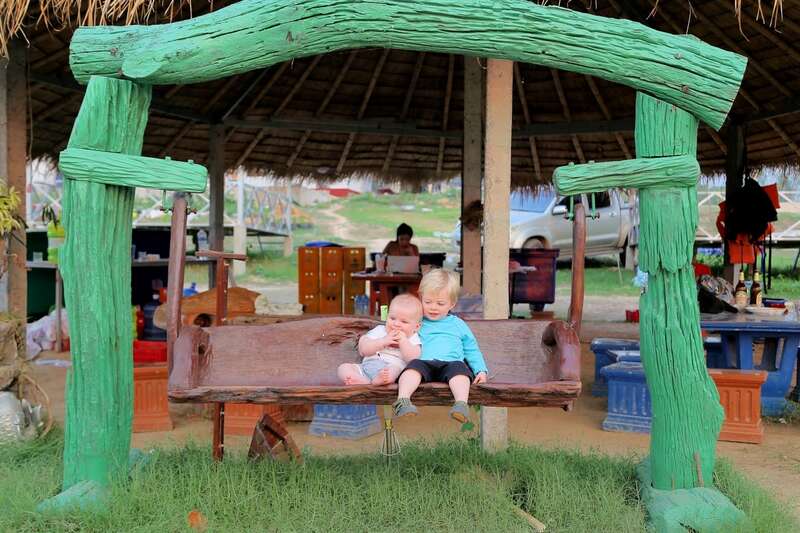 We have a ton of memories in those pickups, from Vang Vieng in the north to Thakhek in the south, and all points in between. They were very good to us and our young family and will most certainly be missed. Lori will have occasional access to a compact car on the weekends moving forward, but as the rainy season approaches, the absence of the pickups (and dramatically reduced access to a vehicle in general) will restrict our out-of-town movements substantially. So, this trip will likely mark the end of an era (ushering in a lot more Vientiane-centered time and a lot more taxis and transport creativity around town…), but that’s the fickle nature of this lifestyle, I suppose. 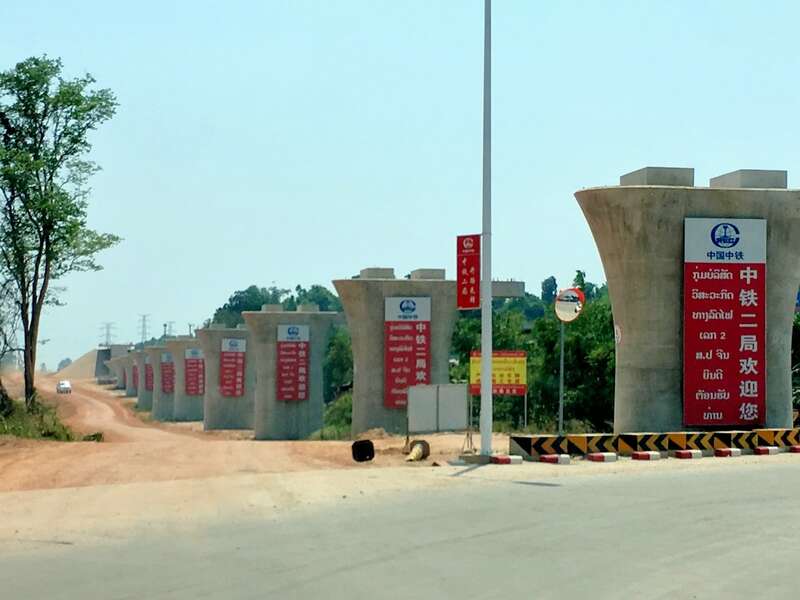 On the way up to the Lake House, signs of the high-speed Chinese rail being constructed across Laos are hard to miss. Hard to imagine — in one of the most under-industrialized countries in the world, with some of the most basic infrastructure in the world — bullet trains zipping passengers between China and Thailand at 300 km/h (200 mph) in a matter of years. Big changes are in store for Laos — but at what cost? Approaching Lao Lake House from the parking area. 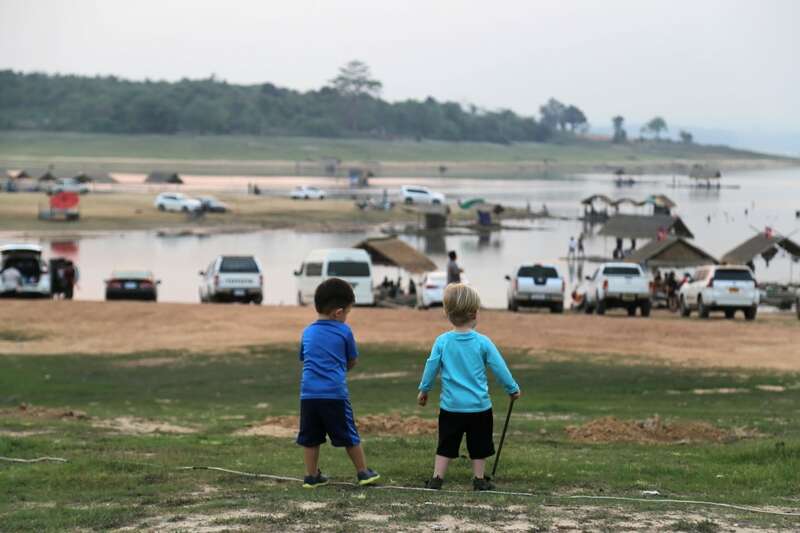 Six years ago, a retired Aussie couple bought an aging residence on the banks of the newly constructed Nam Houm reservoir and began hosting friends from Vientiane. A concrete bungalow was soon built to house guests, and eventually the couple decided to build a new, much larger residence from the ground up. 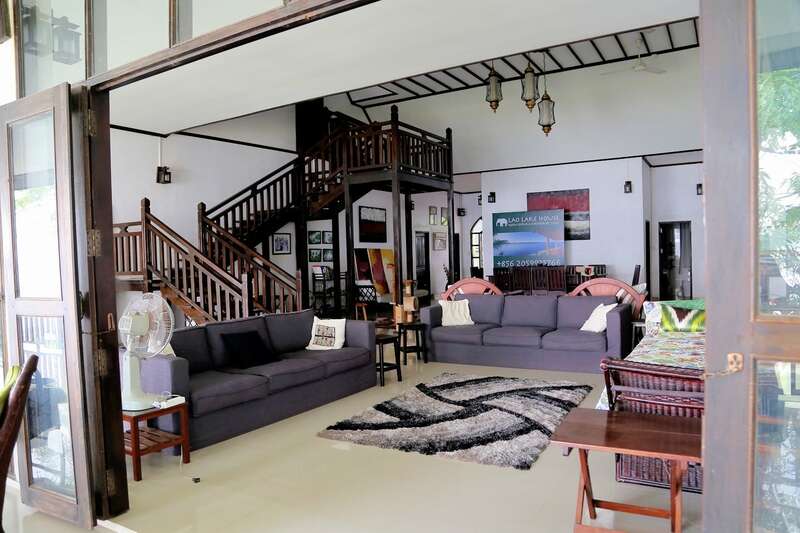 Once completed, they moved into the new villa and rented out the old property, adjacent bungalow, and rooms on the ground floor of the villa to occasional guests, but also made the main villa available for renting to groups as well. 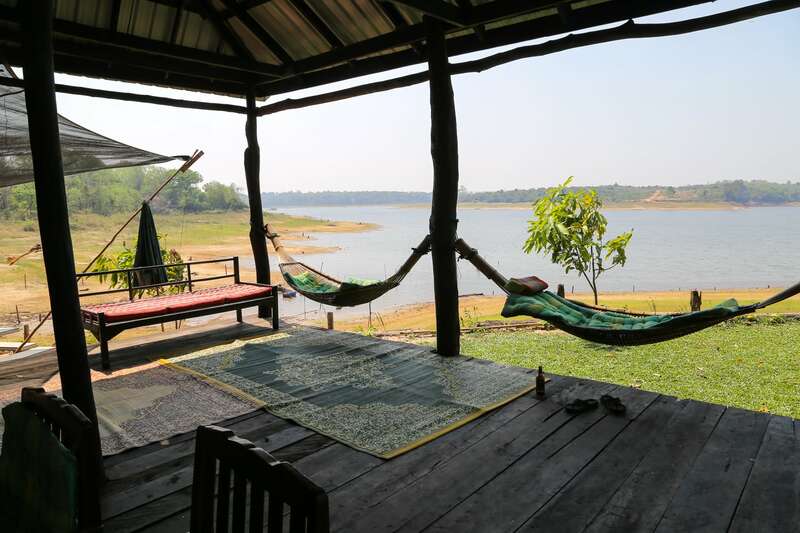 An hour’s drive from Vientiane, the property quickly became a haven for expats looking to escape Vientiane for the serenity and relative comfort of the Lake House. 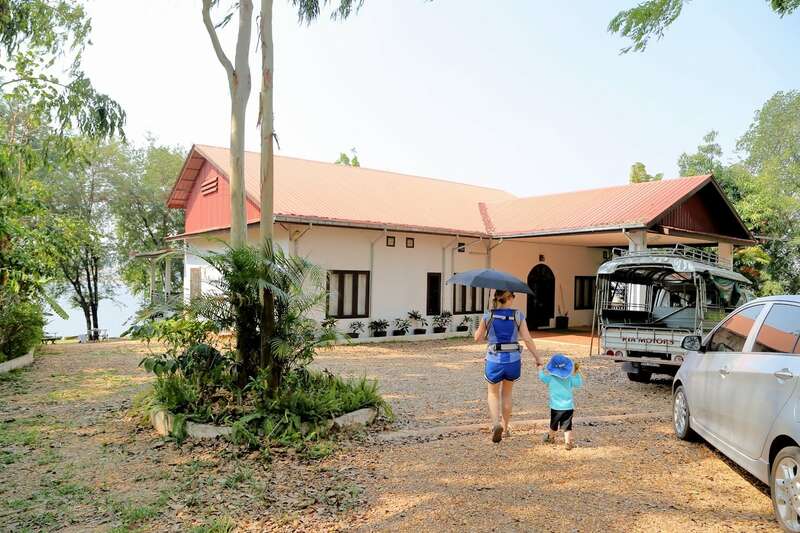 Now, the bungalows and rooms in the old house have become a favorite for expat families from Vientiane, while the main villa has become a favorite for large groups. 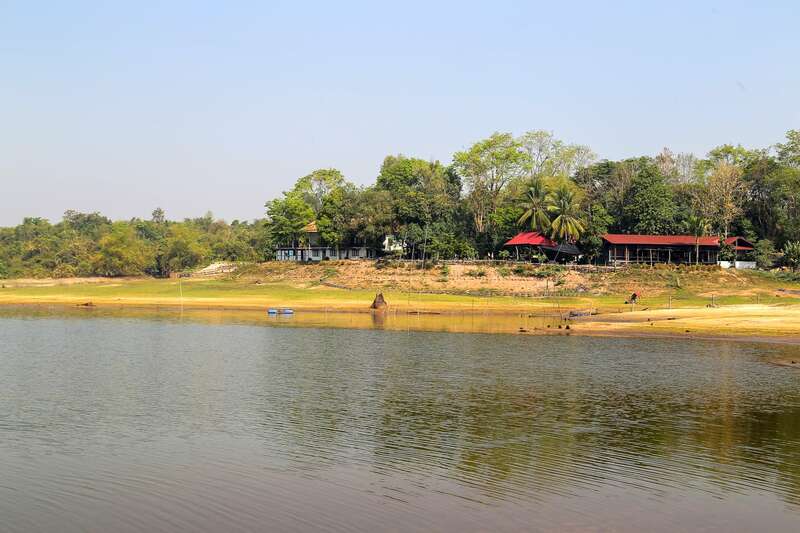 The lake appears far from the house in dry season, but all that green you see above disappears at the height of the rains, as the lake surrounds the rear porch. The house sits atop a reinforced berm, but it must be a very different scene from the rear porch being nearly surrounded by water. We were originally booked in one of the rooms in the old residence, but due to major renovations underway, we were moved into the main house, which ended up being a windfall, particularly with regards to Noe. The main house had buckets of toys galore, and a completely enclosed wrap around deck out back that overlooks the lake. The bungalow and rooms in the old house share an outdoor kitchen, but because we were staying in the main house, we had access to the indoor kitchen, and all the other amenities of the house as well. 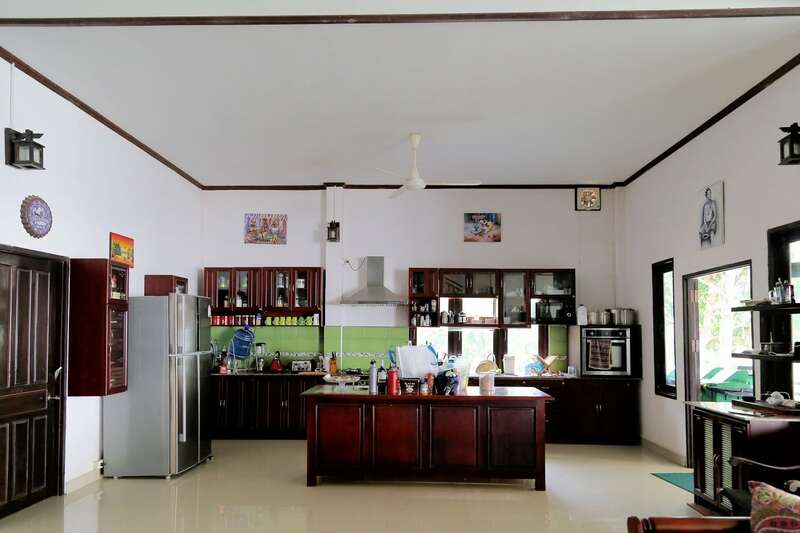 The kitchen is a critical amenity as it’s all self-catering at Lao Lake House. There is a local restaurant across the lake, but not reasonably accessed on foot. And no shops nearby, so guests are encouraged to bring all their food with them from Vientiane, which was another perk of visiting with friends — we were able to share cooking duties. 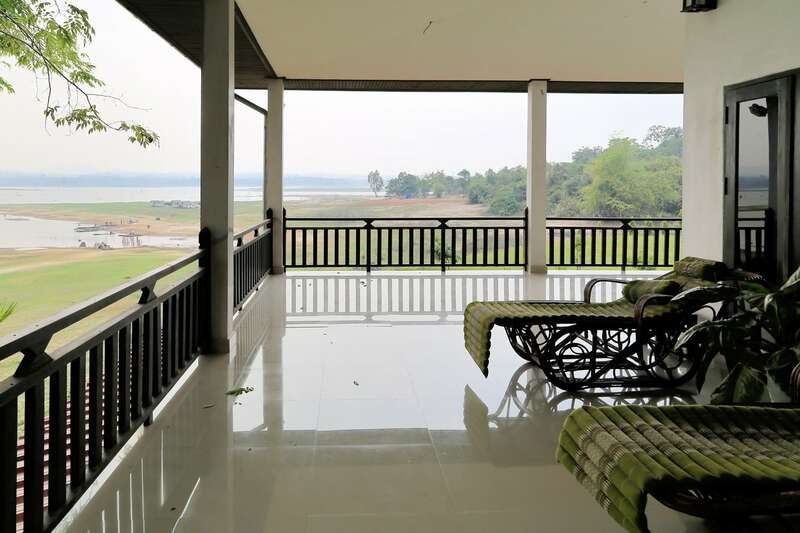 Lake view in dry season from the rear porch/deck. Sala / main living room of the house. As it was a national holiday, we were able to rope some friends into coming with us as well. The couple has a son around Noe’s age that has quickly become Noe’s best buddy here. 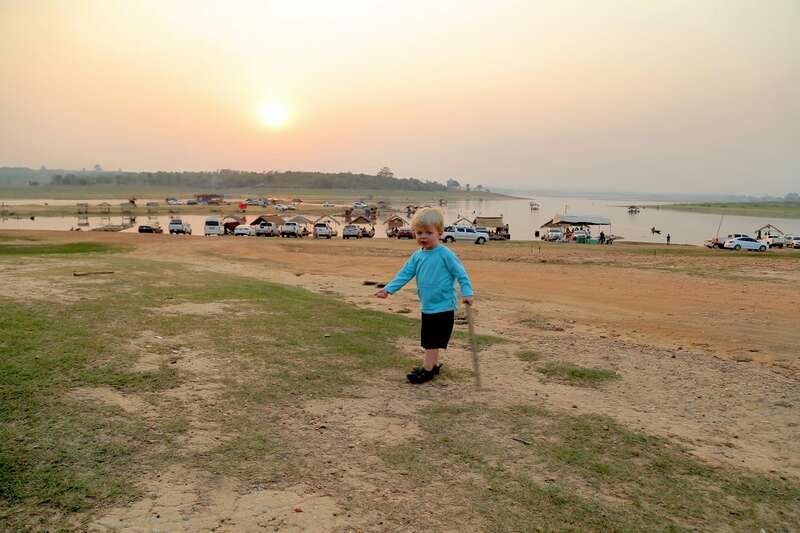 The Lake House gave them endless opportunities to play trucks and explore. They are both pretty well behaved for being toddlers, but are still toddlers. 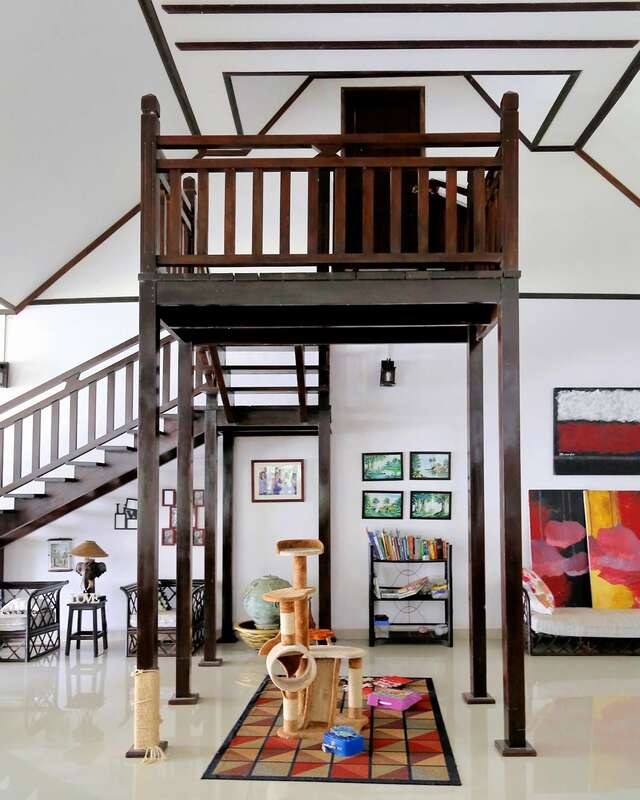 So, thankfully, the friendly owner of the house is very easy going when it comes to kids and was very adamant that we not worry about making a mess and to make ourselves at home, which undoubtedly made the weekend that much more enjoyable. Stairs to the mystery room. 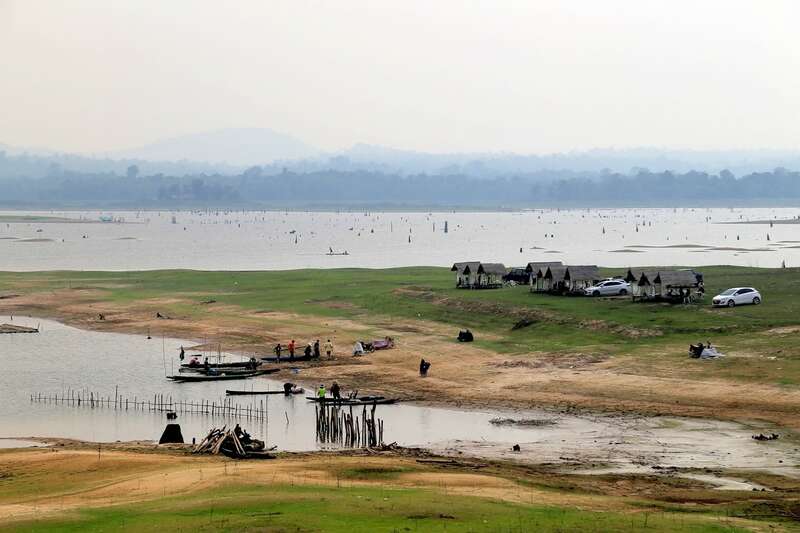 For several days, we’ve been receiving reports of deteriorating air quality in the Vientiane region. It was initially assumed that the smog was drifting down from China (a fair assumption, but ultimately not the case). Then it was thought that we were getting the toxic smog from Thailand — after all, Chiang Mai currently has the worst air quality in the world. 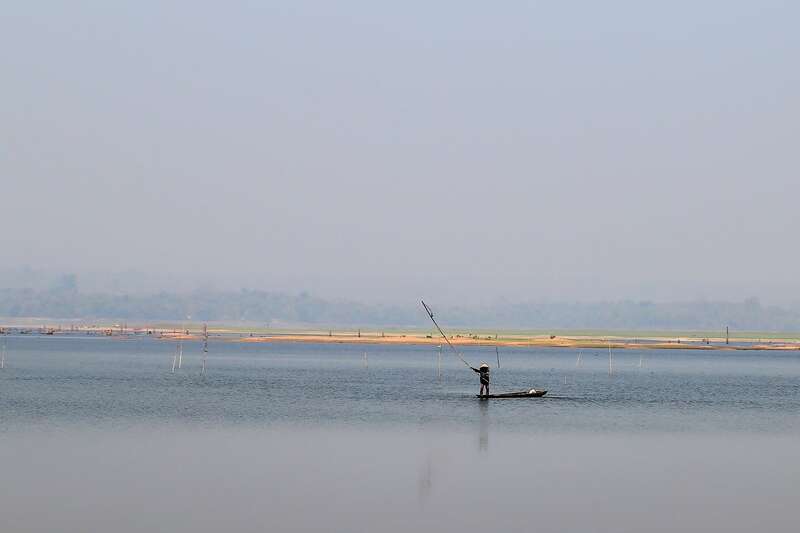 We left Vientiane on a relatively clear day, only to be met with a wall of haze at the lake. As a result, we were treated to an apocalyptic sunset from the back porch. As night fell, we could see a large red glow in the distance. 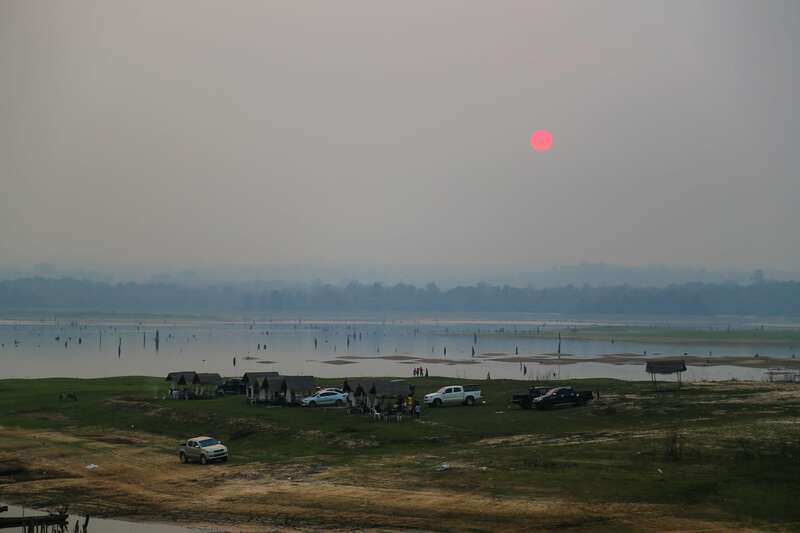 We initially thought it was from slash and burn, but later learned that there were dozens of wildfires around the province causing the bulk of the thick haze. News reports on these sorts of things (in English AND Lao) are hard to come by in Laos. There’s really only one official government newspaper and a handful of “independent” bloggers. In addition, there are huge swaths of the country that simply aren’t inhabited by anyone who would bother to bypass the local authorities and directly report to the outside world. To make things more complicated, like flight tracking and a lot of other things, Laos doesn’t publish air quality readings (we are told this information is collected but not widely reported). If you use one of the leading air quality apps like AirVisual, you’ll notice the numerous reporting stations in Thailand and China, but not a single one in Laos. All data for Laos is estimated by the app based on a combination of satellite imagery and reporting stations in Thailand and China along the Laos border. The air is starting to get so thick and questionable that we will likely be investing in an air quality monitor and air purifier, especially given Noe’s respiratory issues in the past (though, thankfully, the poor air quality hasn’t seemed to affect him along the lines of the symptoms other kids in town are showing. Nonetheless, we’re aware of the long-term impacts of air pollution on children’s lungs and would like to do what we can to mitigate long-term impacts). This was the scene at the lake the next morning. Still hazy in the distance, but fortunately not much of an issue on our side of the lake due to the steady breeze that regularly blows through the valley and across the reservoir. 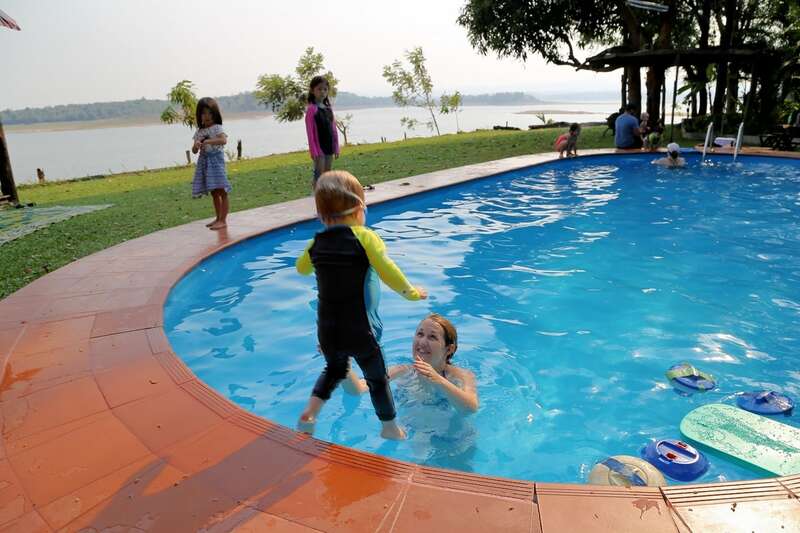 Oh, and did I mention Lao Lake House has a swimming pool? 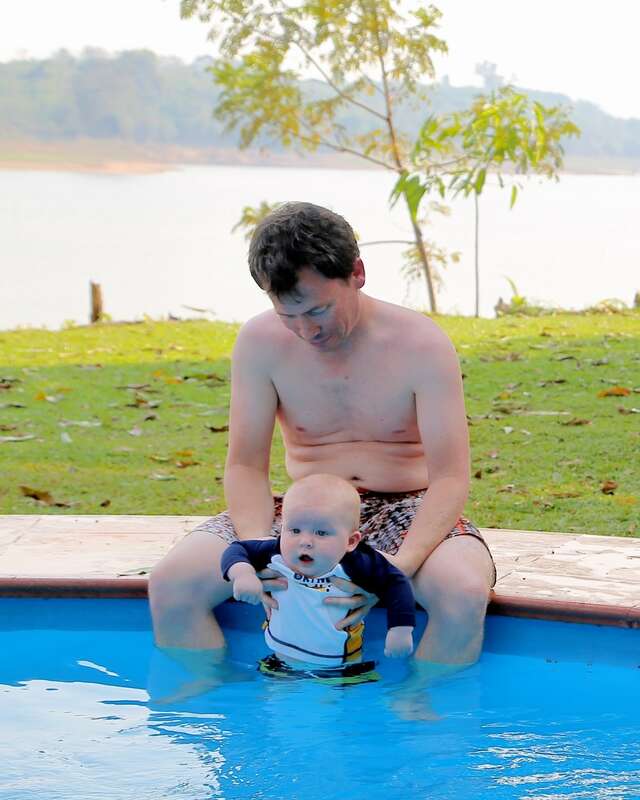 After breakfast, we suited up and went for a dip (this is Southeast Asia, so it’s plenty warm enough for a post-breakfast jump in the pool). There’s also a relaxing hammock hut next to the pool. 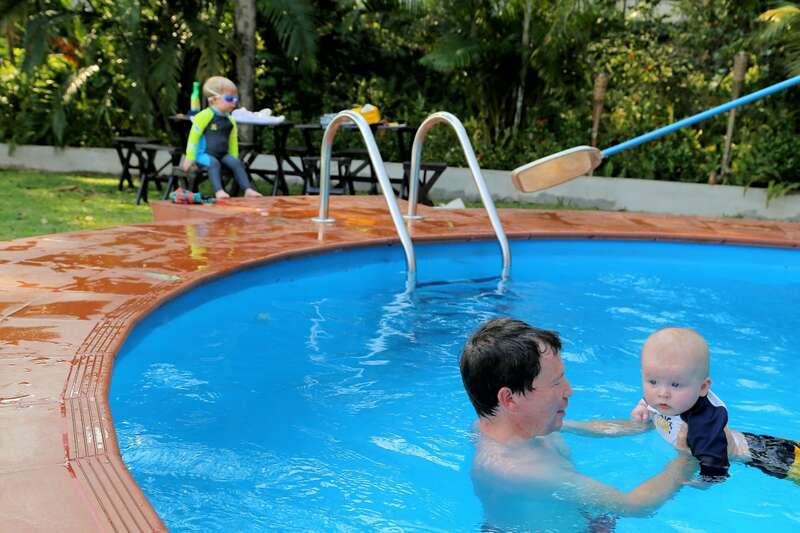 Lori and Noe stayed on in the pool while I went to put Riley down for his morning nap. I handed the baby monitor off to Lori and headed off on the “morning” walk I had been looking forward to all morning. Lao woman fishing Lao-style: Whacking the water with a pole to scare the fish into her net. At the farthest point of my walk, I rounded a point and peered at the tiny village across the lake where the one, lonely local restaurant is (and where the epic Women’s Day rave was the night before). In Laos, even in the countryside (especially in the countryside) there are loud parties and music. It is virtually inescapable. Weekends and holidays are a given. Weeknight parties are not uncommon. 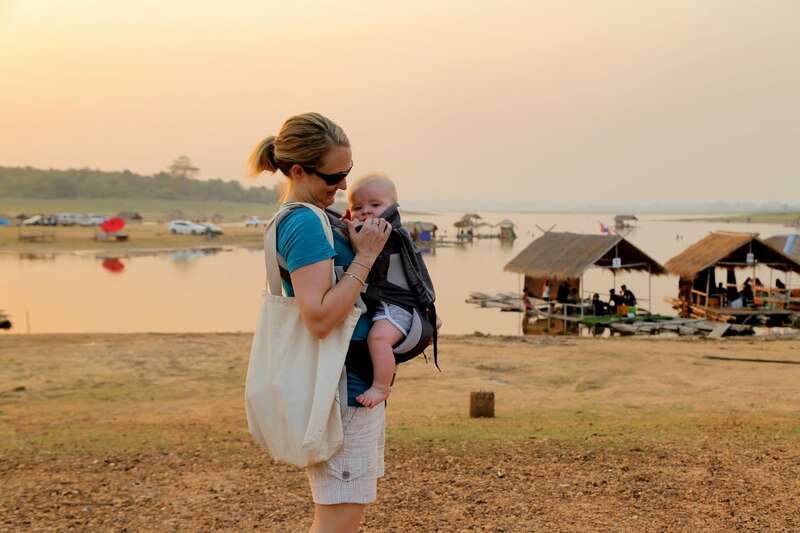 A lot of newcomers to Laos leave Vientiane for the country fully expecting peace and quiet. Haha. Silly newbies. In every rural community we’ve ever stayed in in Laos (dozens! ), there’s always been some party with loud thumping music going on nearby and into the wee hours. The quietest, most peaceful place we’ve ever stayed in Laos is the UNESCO quarter of Luang Prabang (I can only assume because of the huge economic incentive to continue to keep the country’s tourism cash cow appealing to visitors). The second quietest place we’ve stayed? Our current residence in the middle of the capital city — which isn’t to say we don’t get our share of thumping music. Our neighborhood is about as good as it gets in Laos, that is until UNESCO recognizes our humble little dirt alley as having cultural, historical, or scientific significance for the whole of humanity, which isn’t likely to happen any time soon. By 10am it was brutally hot and I was beginning to question whether my walk was a good idea. I still made my way a good distance along the lake shore, but was in desperate need of some quick cooling off when I got back to the Lake House. Fortunately, the pool was still there, ready and waiting. And so was Noe — Aquaman, himself. 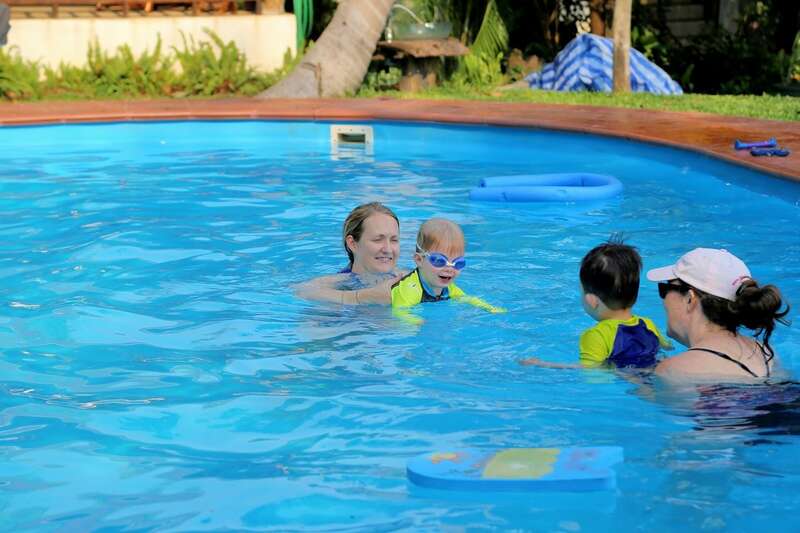 There are few things Noe likes more than the water, and we try to get to a pool or a beach as often as we can. 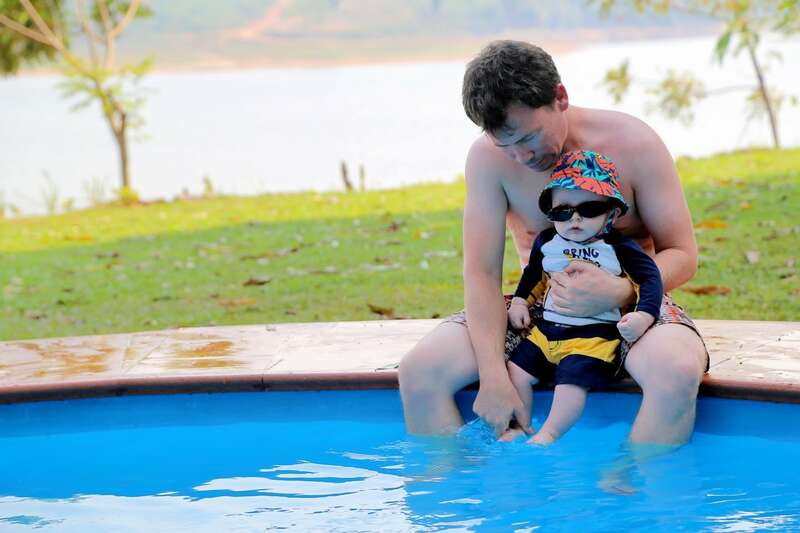 Noe loves to stay in the water as long as we’ll let him, but I hate having to slather him from head to toe in that thick and gooey, high-SPF kid-friendly sunscreen. 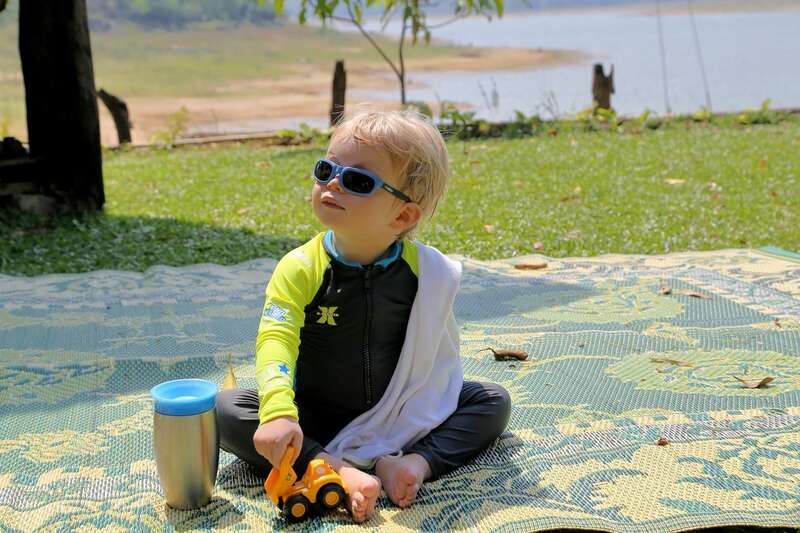 Obviously, it’s necessary to keep our poor blonde-haired, blue-eyed kid protected from the brutal Southeast Asian sun. But I was intent on finding a better solution. 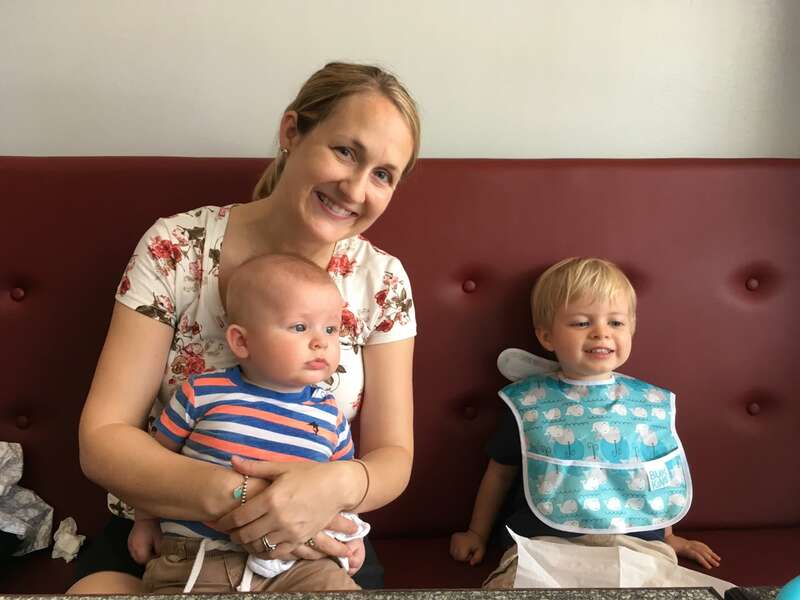 When we went back to the U.S. for maternity leave, we suddenly had access to this small Pacific Northwest startup called Amazon.com (you may have heard of them?). They used to be a bookseller, but now sell literally hundreds of other items, and might even ship to your doorstep! I don’t know if the concept will catch on, as people are pretty leery about sending their credit card information over the world-wide-web, and shipping costs are so expensive. But maybe they’ll establish a cult following or something. After a bit of research, I landed on this SPF 50+ full-body rash guard swimsuit. And it’s awesome! It was so hard to find something in toddler size that covered from neck to ankle. Now, a bit of sunscreen on face, hands, and feet (and a sun hat if we’re in the sun) and we’re good to go. Oh, and I couldn’t resist getting the goggles too, which basically blew his mind the first time he went under water with them. Oh yeah… Riley. What’s he up to? Just chillin’ in the shade. Lori and I, being first-borns ourselves, were under the impression that the babies of the family got all the attention. That’s before Riley came along. As the boys get older and Noe gets more independent, I think Riley will actually get more attention than Noe. But the boys’ personalities have definitely skewed our assumptions, given that Riley’s so quiet and easygoing and Noe is much more outspoken and an attention seeker. Still, as a dad of two boys it’s important to me that attention to the important things be distributed equally. 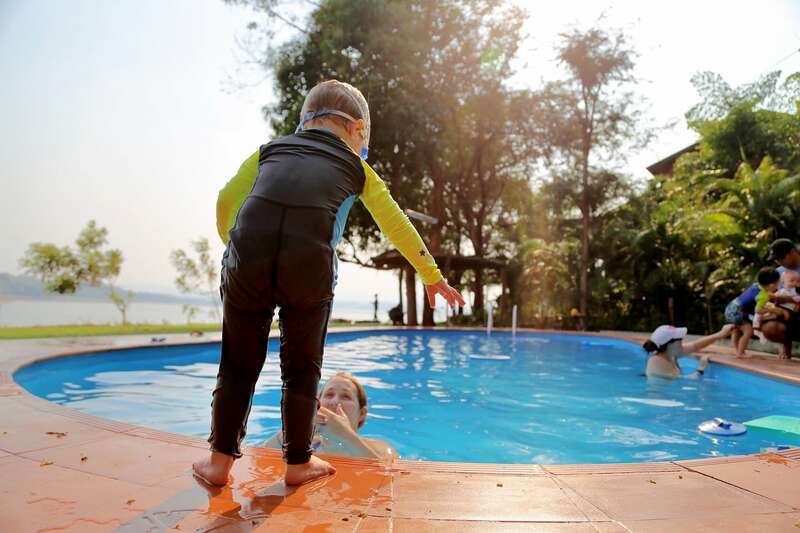 I was the one who first introduced Noe to the water in Tahoe — and, later, a swimming pool when he was around the same age — and I wanted to do a similar thing for Riley. The water has always been a major focus for Lori and me and it’s our hope that the boys will get to grow up around a lot of it in the future. Noe was so good through the whole thing. 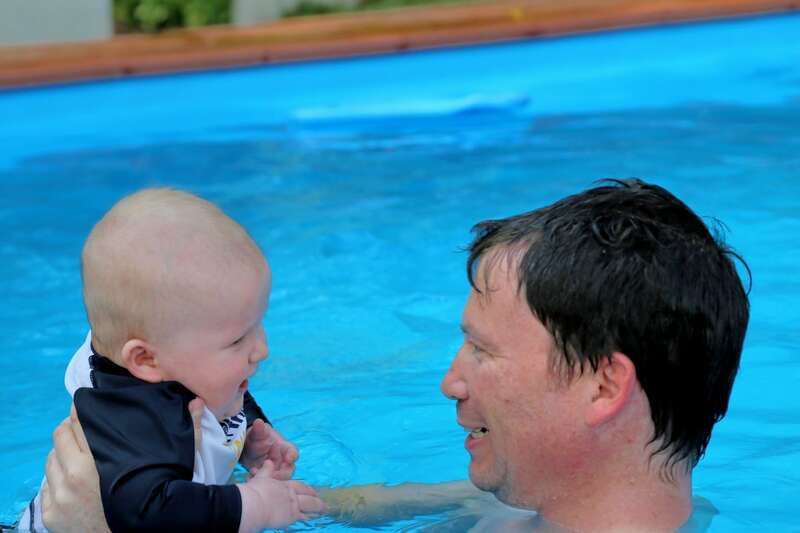 He sat quietly and waited his turn while daddy took Riley in the water and mommy snapped some pictures. Given that we were in the shade, we decided the hat and sunglasses might not be necessary after all. I think Riley welcomed the change of heart. 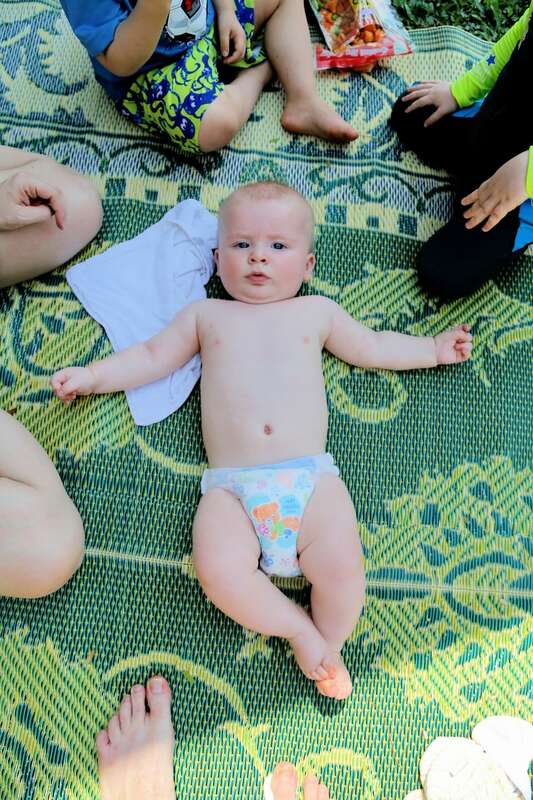 Despite the water being much cooler than any bath he’s ever had in his entire life, this is about as much of an expression we got out of Riley. No tears, no giggles. Stone face. Par for the course for Riley. Mr. Chill. Once he got a bit more comfortable in his new environment, I did manage to get a rise out of Smiley Riley. He’s chill, but he does love to smile. 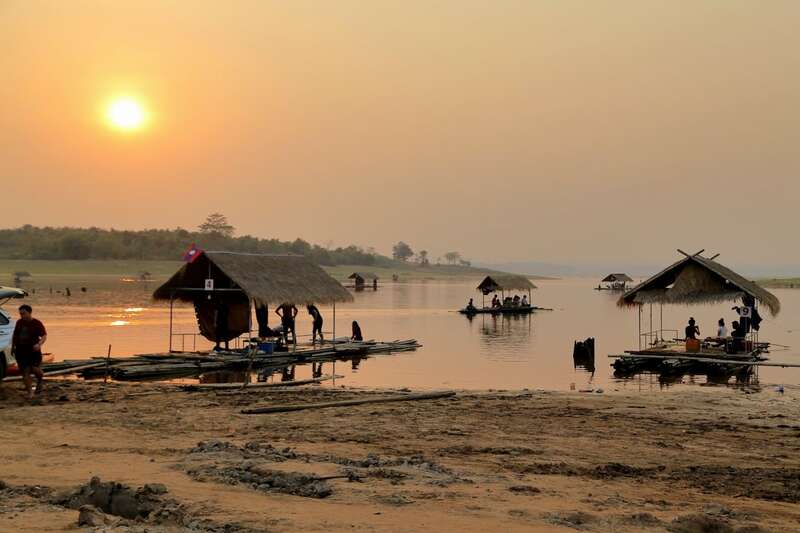 We spent Friday and Saturday night at the Lao Lake House. We ate at the Lake House on the first night and drove to the nearby village across the lake on the second. We weren’t sure what to expect, but were quite surprised to show up around 5pm to find all 20+ huts on the lake already occupied. This wouldn’t be surprising in a lot of parts of the world on a Saturday, but we were not expecting to find this in rural Laos, even on a holiday weekend. 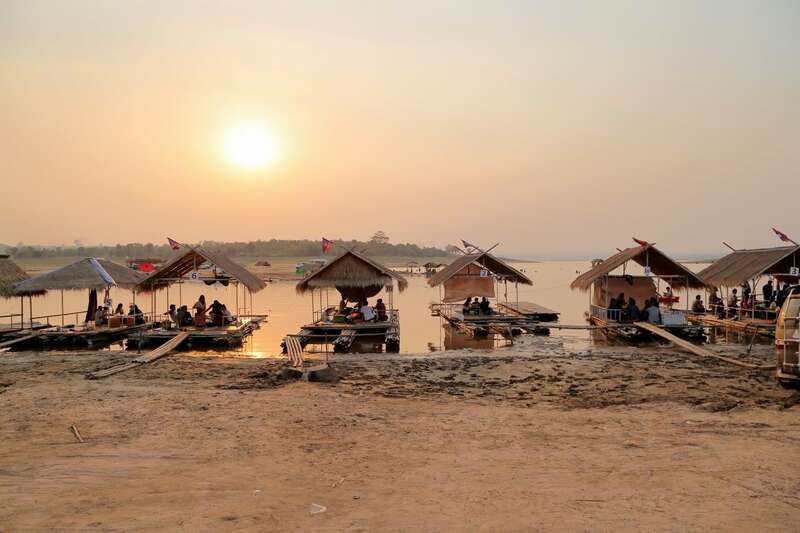 Laos is not a place where you worry about reservations or restaurants filling up. 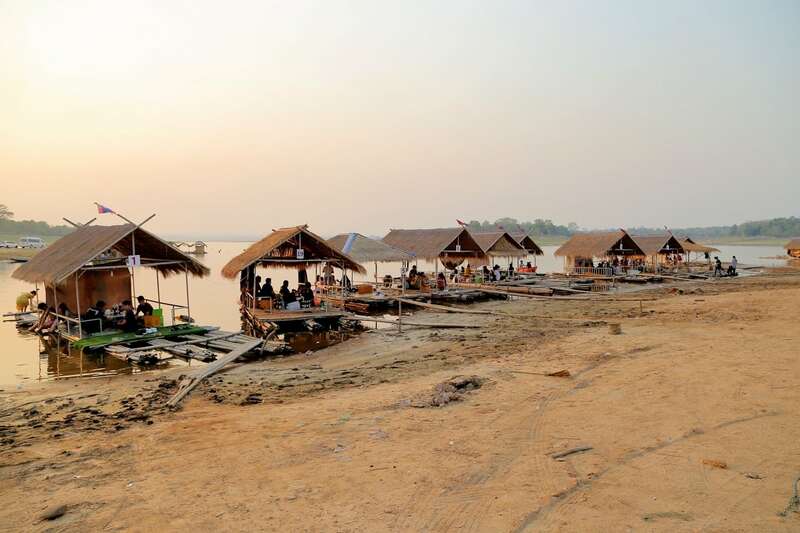 The floating huts on the banks can remain stationary, or you can hire a local boatman with a handheld long-tail motor (akin to a weed-whacker) to take you out on the lake while you eat. 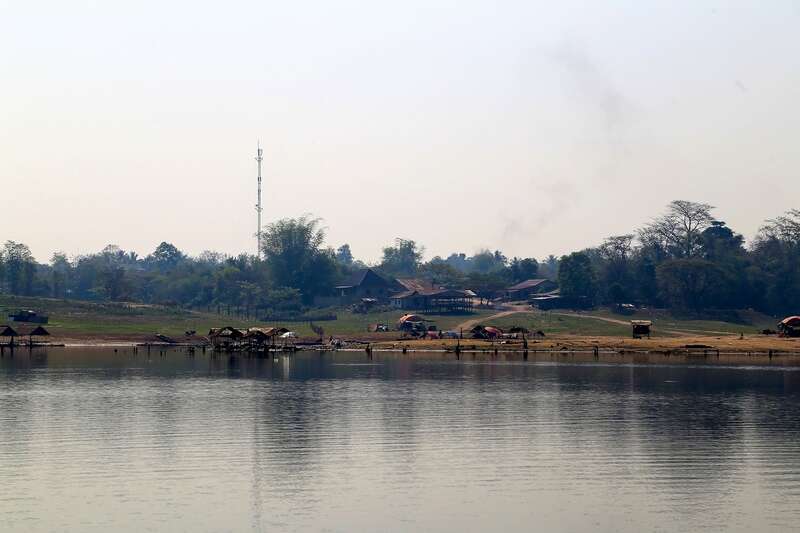 A similar experience can be had under the bridge at Tha Ngon and on the Nam Ngum reservoir near Thalat, but those are much larger steel pontoon boats that ply the Nam Ngum. 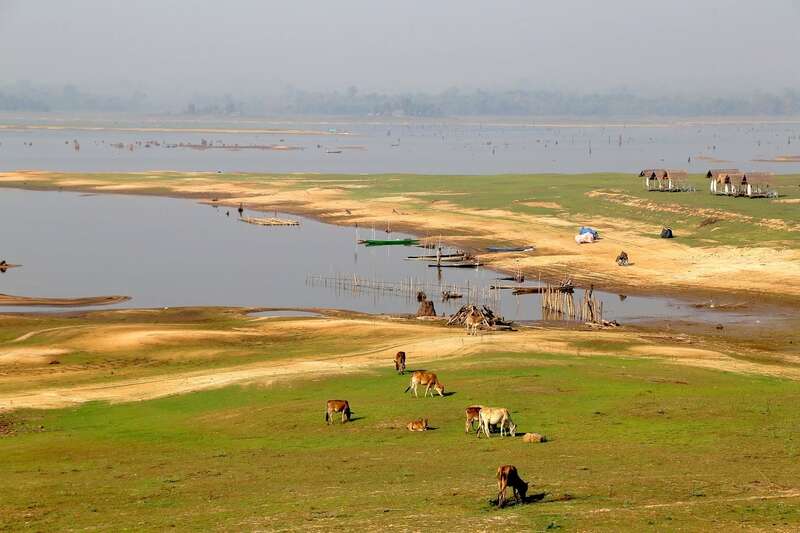 These here on Nam Houm reservoir are more akin to bamboo rafts and stay within the confines of the small inlet. At the top of hill behind the parking lot is a thatch hut where you place your order, then take it down to your floating hut (that is, if you have one, which we don’t). 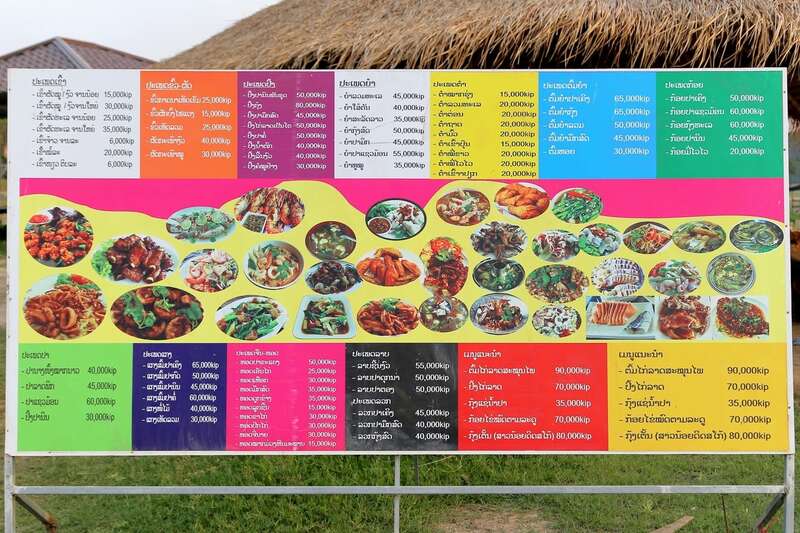 The menu is in Lao, but fortunately for us falang, they’ve got pictures! Since there aren’t any available huts, we’ve decided to order and take it back to the Lake House. In the meantime, Noe and his buddy have sticks to find and holes to throw rocks into. Love the pictures and the narrative. I am glad to hear abut your little get-away. Your family is so photogenic!! 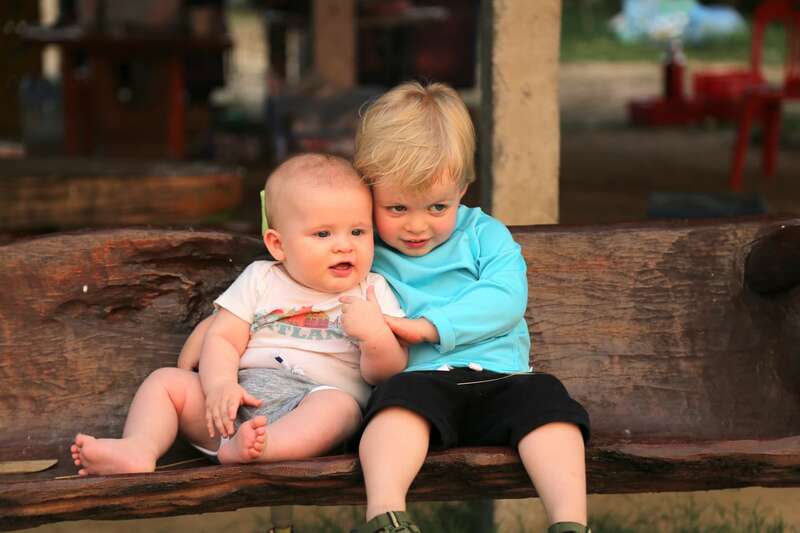 Love the pictures of the two boys together; Riley and Noe, and Noe plus friend.